Espresso Yourself - Life Is Pink is a cleansing and healing detox face mask with organic beetroot, carrot and baobab powder mixed with kaolin and bentonite clay. The mask is 100% natural and quick and easy to make. Suitable for all skin types. The mask comes in an espresso cup with wooden spoon. Make your world a bit more pink with this amazing 100% natural detox face mask. Mix the mask with water and it turns pink. The bentonite and kaolin clay have natural healing and cleansing properties. White clay gives your skin a mild peeling, cleanses your pores and makes coarse pores look finer. White clay also helps to smooth out fine lines and improves the complexion of your skin. Bentonite clay is a very soft mineral clay that is extracted from volcanic ash. A facial mask with bentonite clay absorbs grease and dirt from the skin and leaves a smooth and soft skin. Baobab is rich in antioxidants and vitamin C, carrot repairs and tones the skin and beetroot gives your skin a radiant glow. Life is pink !! Afterwards your skin feels fresh and silky soft! Content: 10g - makes 1 face mask. How does it work? Add water, mix well, apply and rinse after 10 minutes. 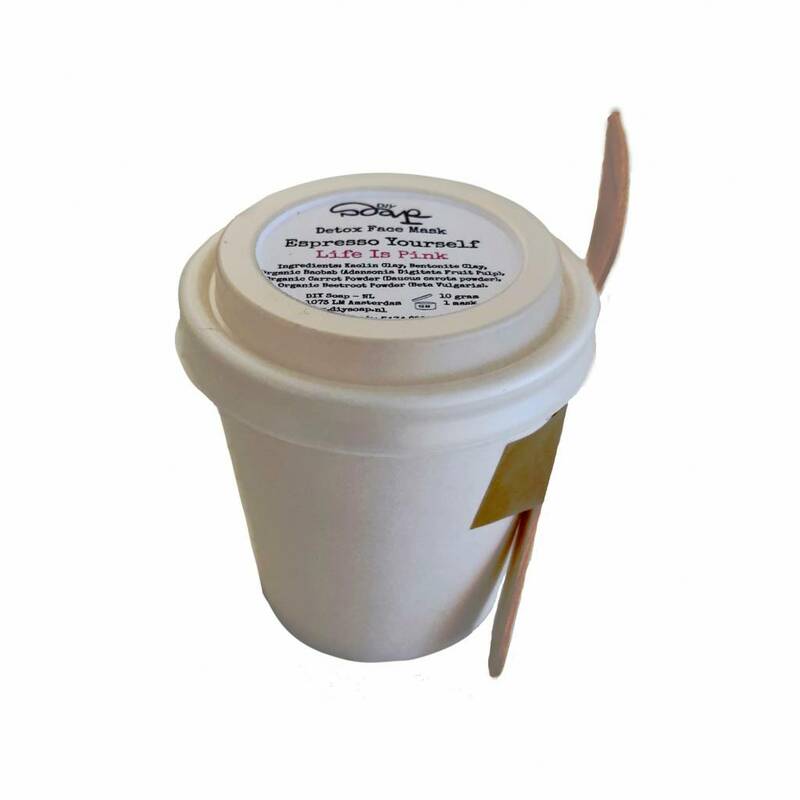 Packaging: Espresso cup with corn plastic lid (both are 100% compostable) & wooden spoon (from certified sustainably managed forest). Kaolin Clay, Bentonite Clay, organic baobab (Adansonia Digitata Fruit Pulp), organic carrot powder (Daucus carota powder), organic beet powder (Beta Vulgaris). 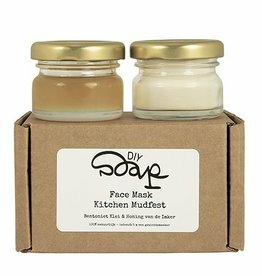 Face Mask Kitchen Mudfest is a deep cleansing and soothing facemask with organic honey from the beekeeper and bentonite clay. 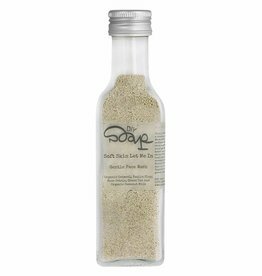 Lovely face wash for sensitive skin! 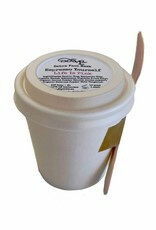 It takes some getting used to, because it is a powder-face wash. Once you've tried this, you won't want anything else!